The Pagan Club is a relatively small group at school that has been around for quite a long time. For that reason, I decided to interview some of the club members and give a brief look into the community for those who may be interested in joining or getting to know about Paganism. Special thanks to President Brittany and Vice President Derya among other club members for letting this opportunity happen. What is the Pagan club? From belief in stones, wicca and everything in between that encapsulates these similar views, Paganism is a very open community. There are multiple gods, there isn’t an organized sect nor is there a real leader. At its core, it is a community religion were participation is key. 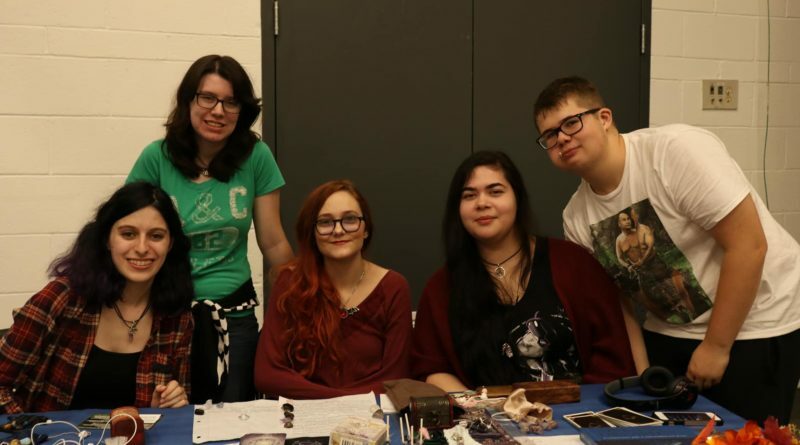 Learning about different pagan beliefs is encouraged and, if someone is interested in something, the club will try to research and practice it as well. Since there is so many beliefs, it is impossible to be close minded as there is so much to learn and to experience. “The Biggest rule in paganism is do what you will but cause no harm” affirmed Vice President Derya. The current club is somewhat of a reboot. Originally, there used to be an older club with its own individual room for meetings and meditation. In fact, it was one of the oldest clubs at Abbott. However, due to bad leadership among other notable issues, such as tension between other clubs and general misunderstandings, it ended up falling apart. A semester after its end, another student, and now former president, decided to restructure the club, under new management, new rules and a new room. The new Pagan club was born. Once she graduated, it was handed down to President Brittany and Vice President Derya, who now both run it together. In the past, anything related to spirituality had caused a lot of prejudice in the old club when dealing with the other religion clubs. Spells and witchcraft would cause eyebrows to be raised: “outsiders who checked out the club would be interested with stones and tarot cards but once spells came into play, they’d look at you like you were crazy.” (Brittany, President of the club). Despite past issues, respect seems to be much more open between the different religious groups on campus now. What does the club have to offer to students who aren’t into paganism? Since they don’t want to enforce their own personal beliefs, the club provides access to a library filled with different books to help learn about the wide pagan beliefs and even other religions. Their library includes the Quran, the Bible and the Book of Taboo, among other goodies. Like in every religious club, there can be instances an extremist believing student shows up and preaches their own beliefs. Lead members will do their best to sift down the tension and keep a comfortable and pleasant environment, which the vice president reassured me of: “if someone only wants to follow one belief, they are free to do so. If they do enforce it on others, then that’s crossing the line. We understand you do it this way, but we ourselves are not professionals and cannot follow or understand everything. We want to be open to everyone.” Both President and Vice President are keen on keeping a safe club community and will personally deal with these troubling club members if need be. In terms of activities, the group is very nature oriented. One of their activities is a group coloring session where everyone goes out with coloring books. The goal is to draw, talk and de-stress in the outdoors. They also do card readings, tarot readings, meditation and breathing exercises, which is, of course, optional. Nobody is obligated to participate in an activity if they are not comfortable with it. In terms of events, they often go to Cunningham’s to chat and eat, have movie nights and celebrate Pagan holidays. For those who are interested in Pagan holidays, Samhain is coming up on October 31st and the club will of course be hosting a celebration. Any main holiday throughout the year has a Pagan equivalent around the same time. For Christmas there’s Yule, which is celebrated every year and for Easter, they sometimes celebrate Ostara. These events and activities are great ways for newcomers to get involved and learn about the community. It is also a good way to meet new people, make friends and have fun. This concludes my brief interview and report of the Pagan Club. Hopefully, I’ve convinced a few of you to check out this club and its friendly community. The clubroom is in the basement of Herzberg (H-014) and meetings are every Thursday at 5:30 in room HO-340.